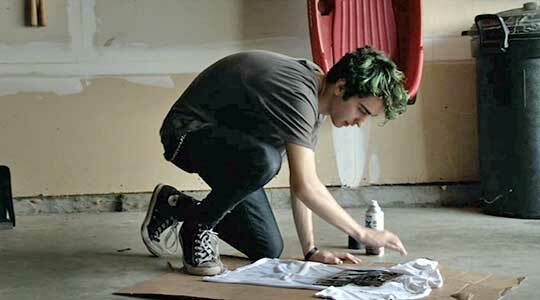 Alex Wolff wears black high top Converse “Chuck Taylor” All Stars in the film. Sebastian and Jared form “The Rash” in The House of Tomorrow. As with most every film set in a small town, there is cast of quirky characters, and in that regard The House of Tomorrow does not disappoint. First we meet Josephine Prendergast (Ellen Burstyn) and her 16-year-old grandson Sebastian (Asa Butterfield). They live in a house of the future, a large geodesic domed building designed by Buckminster Fuller back in the 1960s and now turned into a shrine and museum of his life and futurist teachings. Sebastian was orphaned at a young age and has been raised by Josephine ever since, to the almost complete exclusion of the outside world and in a very new age life style. Sebastian is home-schooled, has no friends male or female, and has been raised to become a deferential acolyte and caretaker of the domed world they live in under the cautious and restrictive guidance of Josephine. He does the cleaning, maintains the dome inside and out, much of the cooking, tends to the organic garden, follows a vegetarian, health food diet, and helps with tours of the dome that are open to the public and include videotapes of Fuller making his predictions about the future. As the film opens, a tour group comes to visit from a Lutheran church in the nearly Minnesota town where we are introduced to Alan Whitcombe (Nick Offerman), the minister and father to teenagers Jared (Alex Wolff) and Meredith (Maude Apatow). Alan tries to be casual in appearance, wearing shorts, running shoes, and a fanny pack but is still unwilling to admit that he is divorced from his wife. Instead he describes her as being constantly on business trips. Jared is rebellious toward his father and others, very much into punk rock music, and living that life style in dress and attitude from the green dye splotches in his hair to his black high top chucks. Even more surprising is when we learn he was a recent heart transplant recipient and still in recovery although he often doesn’t take his medications and smokes cigarettes. Meredith doesn’t get along well with Jared and is amazed to find out how little of the normal activities of teenagers that Sebastian has experienced when they first talk to each other. Jared, Alan, and Sebastian at the hospital. The story gets under way when during the Q and A session at the end of the tour, Jared rudely asks Josephine if she is crazy. As she starts to respond, she suddenly has a stroke and falls to the ground. An ambulance is called and Josephine is taken to the town hospital. The Whitcombes and Sebastian follow in the church van, waiting around for news about Josephine’s condition. Outside the hospital while sneaking a cigarette, Jared introduces Sebastian to punk rock music for the first time, a seminal experience for someone who has only heard whale song soundtracks and Josephine’s classical record albums. Later, as the Whitcombe family is about to leave, Alan feels some responsibility for Sebastian, and sets up a future meeting for Sebastian and Jared by giving Sebastian his son’s email address. It seems that Jared is a loner also, and is resisting going back to school. Alan thinks the two might end up helping each other out. Their first meeting is very awkward, with Jared making fun of the language Sebastian used in his email. But Alan comes up to the room with a tray of grilled cheese sandwiches, which he insists they both stay and eat, helping to break the ice, and the two teens start to form a friendship. Sebastian tells Jared he would like to learn more about punk rock music. Jared somewhat jokingly replies that it will cost him $20 per lesson, and is amazed when Sebastian accepts. So Jared decides to form a band. He persuades Sebastian to “borrow” one of the church’s bass guitars during a youth meeting and there are some hilarious scenes where they attempt to rehearse and Sebastian tries to learn the bass off in the woods so Josephine (now recovering at home) won’t find out. Sebastian, Jared, and Alan discussing Josephine’s stroke outside the hospital. With their friendship developing, along with their plans for the band, Jared thinks it is important for Sebastian to experience an actual punk rock concert. The two take off on the subway to Minneapolis and for the first time in his life, Sebastian gets to act a little crazy, ending up soaked with beer or some liquid during the performance. Luckily the two can go visit Jared’s mom who has an apartment in the city and dry out his clothes. But it’s on this trip where Sebastian comes up with the name for their band: The Rash. Eventually Josephine gets wind of the changes in Sebastian, and she even strikes him in anger after an argument about grilled cheese sandwiches that he served her for dinner. Sebastian hastily leaves the dome, and heads over to Jared’s house, planning to camp out there for the time being. Jared and Sebastian get into a fight with one of Meredith’s boyfriends, when they are spotted making out in her room. The fight takes a toll on Jared, who hasn’t been taking his medications, and must be rushed to the hospital for treatment. In the waiting area, Sebastian has a conversation with Meredith about why she seemingly doesn’t get along with Jared and they start to develop a relationship. With his health relapse, Alan tells Jared that he cannot perform at the church talent show, something they had been planning with their newly formed band. But the two are determined to make a statement with their music, and much of the remainder of the film deals with how they attempt to accomplish this in spite of the opposition by Josephine and Alan to their band. Jared jamming on his electric guitar. While it is not quite clear whether this film is set in the present or the past, given that the film’s main subject matters of punk rock and the futurist thinking of Buckminster Fuller are both cultural movements of the 20th century, writer and director Peter Livolsi has created a screenplay that holds your interest and can appeal to multiple generations. The principal characters are well cast. Asa Butterfield is great as the doe-eyed Sebastian suddenly discovering that there is a whole world out there in the present apart from the futuristic cocoon where he has spent most of his formative years. Alex Wolff also give a strong performance as the rebellious punk rocker wannabe, unafraid to say whatever pops into his head, defiant of his physical condition, and willing to lead Sebastian into a new life style that Jared so much wants to become part of. They end up being quite a team. Maude Apatow plays the afflicted sister to perfection, while smoothly providing Sebastian with his first real interactions with a girl his own age. Ellen Burstyn, who actually did meet Buckminster Fuller, excels as his disciple, the commanding grandmother wishing to mold her grandson into her own image for the next generation. Parents today can relate to Nick Offerman as the Reverend Alan Whitcombe, trying patiently to relate to his rebellious son and hold what is left of his family together, often rebuffed but always willing to keep trying. The House of Tomorrow works because the characters seem real and their interactions are humorous and captivating. An exhausted Jared kicking back on his bed. Jared laces up his black high top chucks. 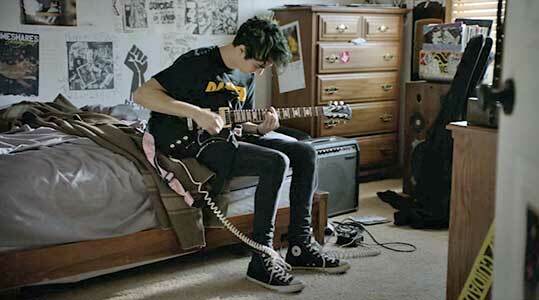 Alex Wolff in his role as Jared wears black high top chucks throughout the film, an essential wardrobe component for a punk rocker wannabe. The cinemaphotography is very chucks-friendly in this film, and they are well displayed in most of the scenes with Jared. There are a couple of scenes showing Jared lacing up or unlacing his chucks. Another good scene is where Jared is kneeling down on the floor, silk screening a t-shirt with “The Rush” on it, the name of Jared and Sebastian’s band. Jared silk-screening the band’s first t-shirt. The House of Tomorrow. (2017) Asa Butterfield, Alex Wolff, Maude Apatow, Nick Offerman, Ellen Burstyn. Written and directed by Peter Livoisi.